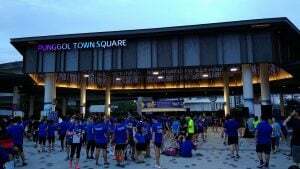 Review: Spartan Stadion and Run for Light 2019 | JustRunLah! 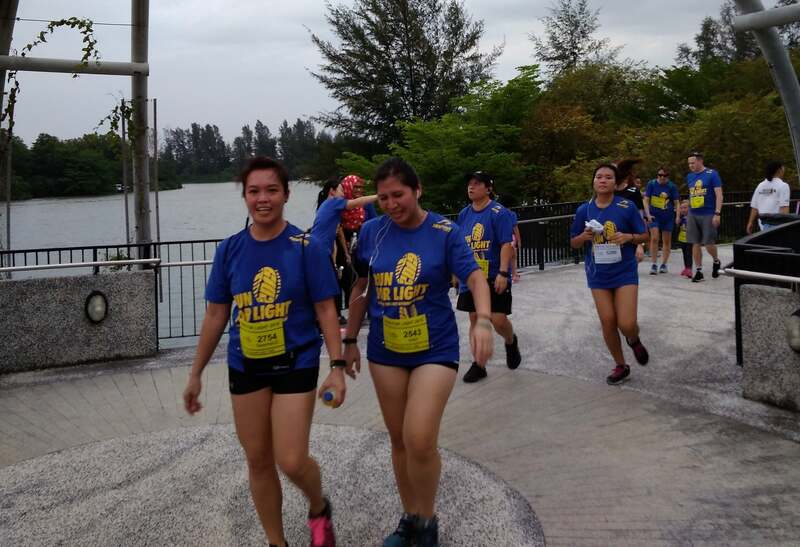 This blog comprises the review of 2 races – Spartan Stadion and Run for Light. Both races took place on the same day – 26 Jan 2019. 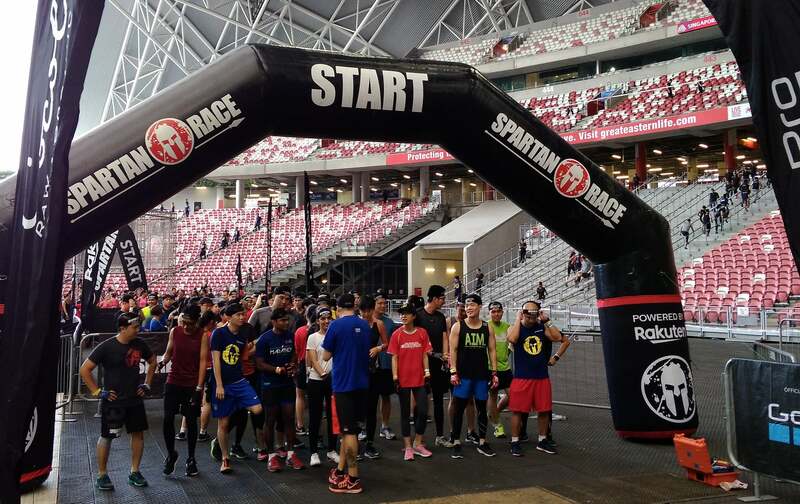 The Singapore Spartan Stadion is the first of its kind in Asia, where the race is run in a completely urban setting. This race is held at the National Stadium, on the 26 Jan. There are 2 categories, namely the ‘Stadion Open’ which consists of age group 14 yrs and above, and the ‘Kid’s Open’ for children below 14 years old. I had participated in the Spartan Sprint Race for the last 2 years. 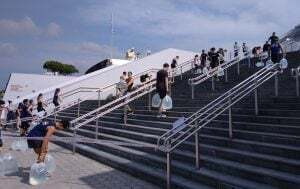 I decided not to take part in the Stadion mainly because I prefer to run in a natural terrain and also, I find that the prices for Stadion are steep. Perhaps this is due to the leasing of the stadium for the event. Nevertheless, I was curious how the race will take place. Hence I decided to be part of the action as a spectator. 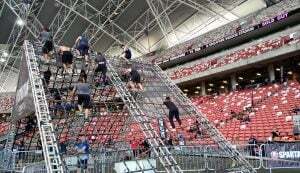 I reached the National Stadium at 9.00 am. The race had already started, with the elites being flagged off as early as 7.30 am. The organizer allocated only one entrance/exit to the race village. I had to fill up and submit an indemnity form and before I can gain access, I had to go through a bag search and body scan. Any filled water bottle had to be emptied. Security was really tight, comparable to that of airport standard! The view from the top of spectator seats to the race site was a sight to behold. It was a hive of activities. With loud, upbeat music being played, there was generally an air of excitement and anticipation. It really got my adrenaline pumping, even though I wasn’t racing! 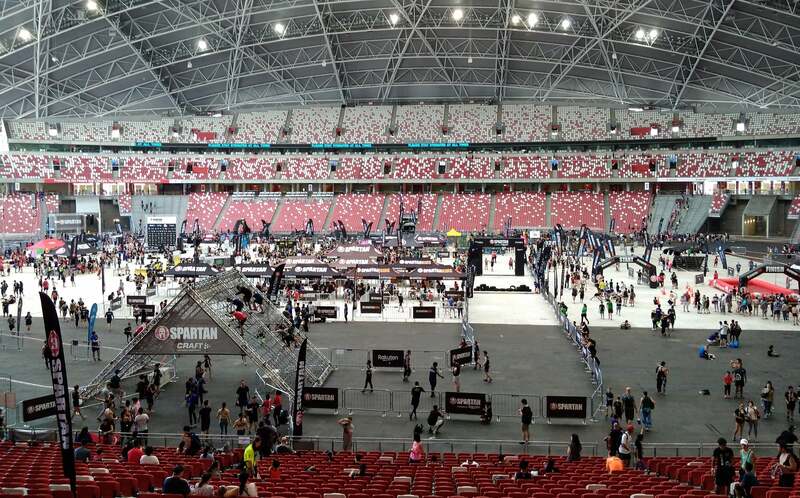 The race village took up almost the entire stadium floor area. There were separate registration counters for Stadion and Kids and many booths for the race partners. There was even a booth for Health Promotion Board! 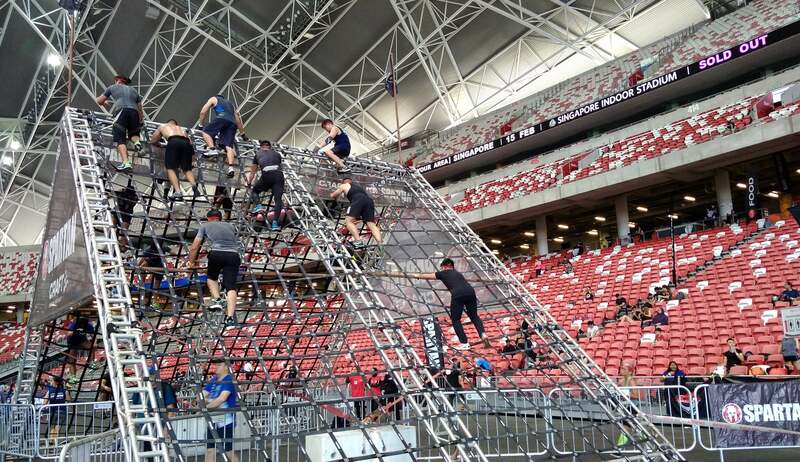 The Stadion consists of 22 obstacles in a 5 km run, while the Kid’s Open consists of 16 obstacles in a run not more than 3.2 km. There were quite a number of children participating in the Kid’s race. Kudos to their parents for letting them try out! Public access to the obstacles were limited and carefully ‘barricaded’. 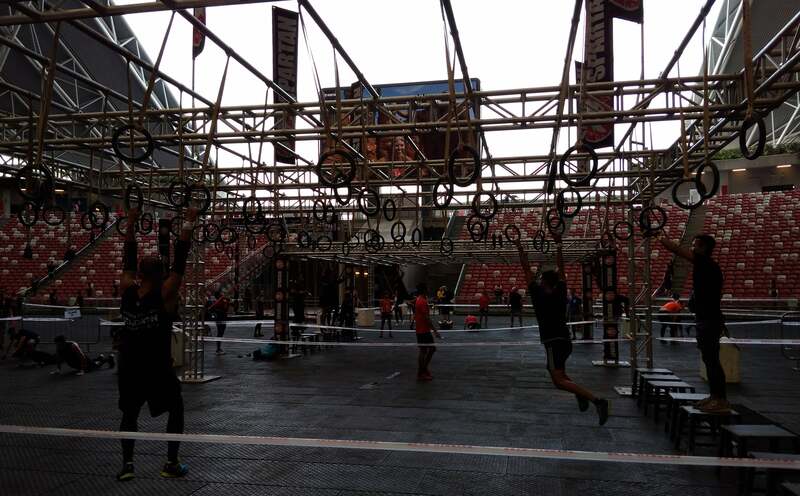 Some obstacles setup within the stadium include the ‘Monkey Bar’, ‘Rope Climb’ and ‘Multi-Rig’. Spartans were also required to carry sandbag up and down the staircases. 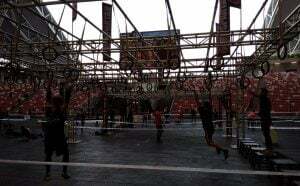 The race route brings the racers to the outdoor, where they had to overcome more obstacles such as ‘Spear Throw’, ‘6 FT Wall’ and ‘Hercules Hoist’. I guess the obstacle that is relatively new to me is the jerry can carry, where female spartans were required to carry one jerry can while the guys had to carry two, in a loop of staircases. Of course there are others too, such as the ‘Heavy Jump Ropes’ and ‘Box Jump’, but I did not manage to catch those in action. Failure to overcome any of the obstacles require the spartans to do 15 burpees as a punishment. This is a discount from the usual 30! The ‘A-Frame Cargo’ is the last obstacle the spartans have to overcome before crossing the Finish Line in the stadium to collect their well deserved entitlements. 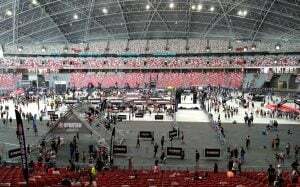 After viewing the Stadion, I would say I still prefer doing the spartan race in a nature environment, with elements of mud, sand and the sun. Stadion is just too clean. But in any case, this is a good race. So, congrats to all the finishers! Into its fourth edition, there are 3 categories to this event: 10 km competitive, 5 km fun run and a 1 km blindfold walk. 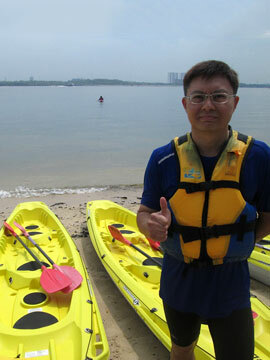 It was held at the Punggol Town Square on the 26 Jan. I was participating in the 10 km run. The first wave of 10 km runners were flagged off at 5.30 pm. This was the right time for an early evening run, as the sun was about to set and the route took the runners along Punggol Waterway, where the tall buildings block out the last rays from the sun, keeping the runners cool. I joined the 2nd wave which was commenced 10 mins later. This is the usual Punggol route which I believe most runners are already familiar with. There is nothing much of a surprise, though I always find it refreshing and enjoy the scenery when coney island is within sight. This is more so at 6.00 pm, where the early evening and quiet surroundings give me a sense of tranquility. There were hydration points for every 2.5 km, offering runners H-Two-O isotonic drink. But I think there were insufficient cups, so at one point, I saw runners drinking out from big bottles instead. This is my second 10 km within the month after the NUS Bizad Charity Run. I decided to take it easy and stopped to a walk-&-run after the 8 km mark. It is always good to slow down, catch your breadth and take in the sights. This must be my first evening run at Punggol. It was really nice seeing families enjoying themselves and having dinner at Punggol Waterway Point. I managed to cross the Finish Line within my usual time. There were a number of booths from the race partners but I think the runners were more keen in the free scoopz ice cream, as evident from the long queue. Fitness instructors from ‘Fit Club’ led the runners to do cool down exercises. I lingered for a while before taking the train home, feeling glad that I had come to Punggol for an evening run.